Although it is commonly thought that a distinguishing feature of the NAO brand is that it does not have Lladró's famous, separately applied flowerwork, that is not, in fact, the case. Wherever the NAO models listed here have applied flowerwork, there will be an asterisk next to the flower reference. If the item does not have an asterisk, the reader may assume the flowers are "molded" into the model itself. Unusual bust with flowerwork in basket. Sculptor: José Puche 1984 $95 $135-$150 Little girl in long pink skirt and wearing apron and bonnet carries potted flower in arms, with watering can looped over her right elbow. Sculptor: José Roig 1984 $200 $275-$300 Very tall (17"/43 cm) model, young girl wearing flowered laurels, long white, sleeveless dress, pink embossed accents, holding roses* in hand. Also made as Zaphir (see Zaphir catalog ). An unusually large model for a NAO. * Also made as Zaphir (see Zaphir catalog ). Sculptor: Francisco Catalá M-1991, G-2008 $140 $150-$165 (G), $175-$185 (M) Girl with long dress, gray ruffle at hem and puffy gray sleeves, white skirt, holding bouquet of tulips*. Sculptor: Regino Torrijos 2008 $80 $85-$95 Girl in long, flowing brown skirt and long-sleeved blue top, white straw hat, carrying basket of flowers on right arm. Also made as Golden Memories #33021 (see GM catalog). Also made as Golden Memories #33023 (see GM catalog). Sculptor: Vicente Martinez 2006 $55 $65-$75 Girl in long white dress, holding spray of red flowers at breast in right hand, broad-brimmed blue hat with flowers on hat-band in left hand. 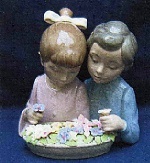 Sculptor: Francisco Catalá 1997 $210 $210-$225 Little girl in blue overalls, white hat, kneeling behind wheelbarrow with blossoms, clipping flowers from bush. Sculptor: Regino Torrijos 2008 $115 $100-$115 Girl in broad-brimmed hat and long white dress with embossed hem, basket of flowers in right arm, holding skirt up with left hand. Sculptor: Juan Carlos Ferri Herrero 2008 $145 $150-$165 Girl with side ponytails and wearing sleeveless white dress with blue piping at hem, holding bouquet of flowers in crook of left arm. Sculptor Unknown 2010 $119 $100-$120 Small girl in long white dress with blue apron and holding a bouquet of carnations. (NB: The carnations are molded, not flowerwork.) This item is part of a series of three in similar theme that included #s1536 & 1537 below. These items do not appear in the catalog on the official NAO web site and may have had limited distribution. Sculptor: Begoña Jauregui 2010 $139 last retail $125-$130 Young girl in long white dress with loose blue sash and carrying a basket of flowers (molded flowers, not flowerwork). Sculptor: Alfredo Llorens Issued 2009 $99 current issue N/A See official NAO web site. Little girl wearing kerchief, hitching up skirt of long dress with pink empire waisted top, holds flower in her hand at which she sniffs with eyes closed. Sculptor: Eva Maria Cuerva Issued 2009 $109 current issue N/A See official NAO web site. Young boy with wearing white short-sleeved shirt and blue trousers, holding molded flower bouquet behind his back, a brown school satchel on the ground by his side. Sculptor: Alfredo Llorens Issued 20010 $105 current issue N/A See official NAO web site. Little girl in long white, sleeveless dress, holding a straw hat full of strawberries. Sculptor: Begoña Jauregui Issued 2010 $110 current retail N/A See official NAO web site. Little girl in long blue and white short-sleeved dress, reaching up to touch her brimmed hat with left hand and carrying bouquet of pink flowers in her right. Sculptor: Raul Rubio Issued 2014. Ret. c.2016 Unknown Unknown See official NAO web site. 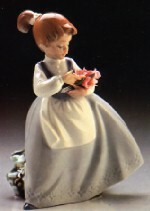 Little girl in knee-length, sleeveless white dress with blue belt and holding molded rose in hand and basket of molded roses in crook of right arm. Sculptor: Jose Sanateulalia Issued 2011 $285 current retail N/A See official NAO web site. Gres model of a little girl in ponytail and sleeveless dress and holding a blooming flowerpot.